Gout is an arthritis caused by the inflammatory response to intra-articular monosodium urate crystals. Supersaturation of urate typically occurs in physiological fluids above concentrations of 0.42 mmol/L. In early disease, gout presents as recurrent episodes of self-limiting acute inflammatory attacks (‘flares’) of arthritis. These attacks most often affect the 1st metatarsophalangeal joint, midfoot and ankle. In the presence of prolonged hyperuricaemia, some patients develop recurrent polyarticular attacks, chronic tophaceous disease, erosive arthritis and renal disease (urate nephropathy and uric acid stones). Gout is an arthritis caused by the inflammatory response to intra-articular monosodium urate crystals. Supersaturation of urate typically occurs in physiological fluids above concentrations of 0.42 mmol/L. In early disease, gout presents as recurrent episodes of self-limiting acute inflammatory attacks (�flares�) of arthritis. These attacks most often affect the 1st metatarsophalangeal joint, midfoot and ankle. In the presence of prolonged hyperuricaemia, some patients develop recurrent polyarticular attacks, chronic tophaceous disease, erosive arthritis and renal disease (urate nephropathy and uric acid stones). Asymptomatic hyperuricaemia � asymptomatic hyperuricaemia has traditionally remained untreated with drugs. Although evidence is building, linking hyperuricaemia with cardiovascular and renal disease, treatment remains unproven. Identification of hyperuricaemia presents an opportunity to suggest diet and lifestyle changes to patients and also to look for possible underlying causes for the raised uric acid. Of those with hyperuricaemia, 20% will go on to develop acute symptomatic gout. Acute attacks � typically the first attack involves one joint but it can also be polyarticular. Without specific treatment, an attack of acute gout is likely to resolve within 7�10 days. In practice, the severe pain usually forces patients to seek pharmacological relief. Intercritical gout � the length of time between attacks can vary widely. Some patients only ever have one attack, but for the majority, a second attack will occur within a year. If the urate level remains high (>0.36 mmol/L) despite the patient being symptom free, there can be ongoing joint inflammation and hence joint damage and tophi formation. Chronic tophaceous gout � tophi are firm white translucent nodules in connective tissue arising from the deposition of urate crystals. They can take at least 10 years after the initial attack to develop. As well as causing joint destruction, they are disfiguring and also cause physical hindrance. Tophi can become inflamed or infected and can exude tophaceous material. Figure 3: Needle shaped MSU crystals identified within the joint. Viewed under polarizing light with a red compensator. NSAIDs: given at regular intervals until the severe pain abates, at which time the dose may be reduced (e.g. starting with naproxen 500 mg bd or diclofenac 75 mg bd). Always watch for renal impairment, heart failure and peptic ulceration. If patients are already taking low dose aspirin for cardiovascular risk reduction it should be continued. Oral corticosteroids: in view of the toxicity of colchicine, corticosteroids may be preferred to treat acute gout in patients in whom NSAIDs are contraindicated, provided sepsis has been excluded. The initial dose is 15�40 mg prednisone daily, gradually reduced over 10 days. Intra-articular corticosteroids are useful if monoarthritis is present to reduce risks of systemic therapy. Colchicine: can be a useful adjunct to NSAIDs in resistant cases, particularly when tophi are present, as monotherapy or to prevent flares when starting allopurinol. Allopurinol: If a patient has been taking allopurinol regularly at the time of developing an acute attack it should be continued at the same dose. **Diuretic therapy is a risk factor for the development of hyperuricaemia and recurrent gout attacks. Diuretic therapy should be minimised and avoided wherever possible. Due to recent concerns about toxicity, colchicine is no longer considered first line treatment for acute gout. In addition colchicine should be used at a lower dose than has been recommended in the past. After the first 24 hours, the dose should be reduced to 0.5 mg one or two times daily, according to renal function. Prescribed in this way colchicine is safe and effective. The risk of diarrhoea and other toxic effects is minimised. Many patients report that one or two colchicine tablets taken within the first few hours of the onset of pain can avoid a major flare. Colchicine has a narrow therapeutic margin and considerable variation in absorption between individuals. Toxic effects include diarrhoea, nausea and vomiting, electrolyte imbalance, alopecia, haematological effects, pancreatitis, and failure of kidneys, liver or respiratory system. High doses can be fatal. It should be noted that although effective treatment of gout can lead to regression of tophi, management is far more difficult once tophi develop, due to the high total body urate load. Reduction of the serum uric acid level requires both pharmacological and non-pharmacological management. Allopurinol is the first choice urate-lowering drug unless there is a history of allopurinol allergy/intolerance. Use prophylaxis against acute attacks. 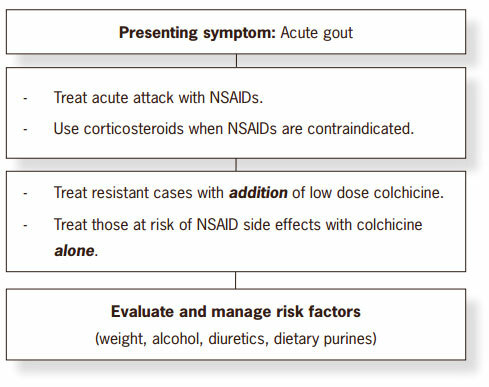 Prophylaxis with colchicine (0.5 mg daily to twice daily) or NSAIDs for the first three months of starting allopurinol (or until serum uric acid <0.36 mmol/L) should be prescribed to reduce the risk of gout attacks.14 Ensure the patient knows that in this situation the colchicine is for gout prevention and the dose should not be altered without medical advice if an acute episode occurs. Monitor serum uric acid levels on a monthly basis while establishing allopurinol. Once serum uric acid is <0.36 mmol/L, monitor uric acid and renal function on a three-monthly basis. Allopurinol should be continued as life-long therapy for management of gout, except in the case of allopurinol intolerance. Do not stop taking allopurinol during an acute attack of gout. The uricosuric agent probenecid is an effective urate-lowering drug in patients with normal renal function and urate under-excretion. This agent is particularly useful in combination with allopurinol if there is persistent hyperuricaemia despite therapeutic doses of allopurinol, or in allopurinol intolerance.15 A typical dose is 250 mg twice daily for two weeks, then 500 mg twice daily thereafter. Probenecid is contraindicated in patients with a history of renal stones. Patients should be advised regarding the importance of high fluid intake while taking probenecid, around eight glasses of water per day. About one third of body urate comes from the diet, two thirds from endogenous tissue catabolism. Under excretion of urate by the kidneys is the cause of high serum levels in over 80% of adult patients. Insulin resistance (metabolic syndrome) is associated with increased urate resorption and higher serum urate levels. About 20% of males have a serum urate above 0.42 mmol/L, but this has been chosen as the upper end of the male range because at that level urate becomes supersaturated in body fluids at 37�C, resulting in increased crystal deposition in tissues. Above this level the 5�year risk of gout rises fifty-fold from about 0.1% below 0.42 mmol/L to 5% above 0.54 mmol/L. Above 0.60 mmol/L the 5�year prevalence of gout is about 30%. An upper limit of 0.36 mmol/L is used for women because their levels before menopause average 0.06 mmol/L lower than men. After menopause, levels in women approach those in men and the risk of gout increases, being similar to men over age 60. Serum urate is the most important predisposing risk factor for gout, but is not used alone to make the diagnosis. Most patients with high urate levels do not develop gout and, conversely, serum urate may be normal, especially during acute attacks. 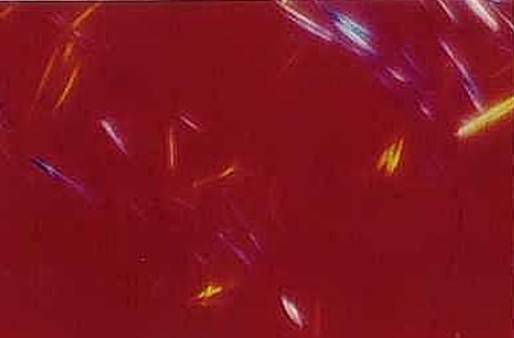 Visual identification of crystals from joint fluid or tophi is the gold standard. For patients with clinical gout on long-term treatment, a target urate level of 0.36 mmol/L has been recommended by some international bodies. The long-term risk of gout recurrence is much lower when levels are maintained below this threshold and it also favours the slow dissolution of chronic tophi, being well below the solubility constant of urate. Weight management is the key component in dietary management of gout. A 5% loss in body weight leads to a 10% reduction in serum uric acid level.16,17 Diets very low in purines are generally unpalatable and poorly tolerated over time. Patients are more likely to accept advice to reduce purine-rich foods than to be told not to eat them at all (Table 1). Patients should be encouraged to eat regular meals and to drink plenty of water. There is increasing recognition that asymptomatic hyperuricaemia is an independent risk factor for development of CVD. 25 However, there is no current evidence that treatment of asymptomatic hyperuricaemia reduces the risk of subsequent CVD events. If you identify a patient who is regularly purchasing over-the-counter (OTC) medications for the treatment of gout, encourage them to consult their GP to discuss the use of uric acid lowering medication, for the prevention of future attacks. Pharmacists can make a difference by helping identify patients at high risk of gout who may benefit from prescription medication. Gout in New Zealand is common and increasing, particularly amongst Māori and Pacific Islanders. It is often poorly treated and is a major cause of significant disability. Early intervention is vital. Educating patients to accept that OTC pain relievers will not stop joint damage and that they are only of limited benefit in an acute attack may help persuade people to visit their GP. Many patients are not aware that gout can be prevented through the use of allopurinol. Those who have had a second acute attack require GP assessment and likely use of allopurinol. Good treatment of gout requires a team approach. Encouraging people who are in a high risk group to see their GP will help achieve effective treatment of gout. These high risk patients may also benefit from cardiovascular risk factor assessment. Gout is the most common form of inflammatory arthritis affecting men.29 Gout is uncommon in pre-menopausal women. Most women with gout are post-menopausal and taking diuretics. Gout is on the increase in New Zealand.30 Recent data from primary care in Auckland shows that gout affects 14.9% Pacific men, 9.3% Māori men and 4.1% European men (Richard Hulme, East Tamaki Health Care, 2006). The same data has shown that gout is more frequently diagnosed than Type II diabetes in Māori and Pacific Island men. Gout is now the most frequent cause for new patient referral to the rheumatology outpatient clinic in South Auckland, and accounts for more than 200 inpatient admissions to Middlemore Hospital each year.31 Māori and Pacific patients with severe gout are over-represented within gout clinics in the Auckland area (Table 1). Māori and Pacific patients attending these rheumatology clinics have higher serum uric acid levels, more work disability and lower levels of musculoskeletal function than European patients (N. Dalbeth, unpublished data). Why is gout such a problem in Māori and Pacific communities? A study of gout patients in South Auckland has revealed some key issues (personal communication, Dr K Lindsay, CMDHB). There is minimal knowledge about gout and the medications used in treatment. Amongst the Pacific Island community in particular, there is a normalisation of gout, a stoicism and tolerance of the pain. Often knowledge of gout is based on jokes about over-indulgence, old age or unhelpful myths. These beliefs contribute to denial and result in missed opportunities for early diagnosis. Families take up the burden of caring for gout patients and these patients rarely present to general practice. Typically patients will use pain relief but not preventative medications, with a resulting increase in the number of joints involved, the size of tophi, the frequency of attacks and number of days off work. Without appropriate use of allopurinol, their gout is progressive and becomes chronic. Gow P. Gout. PHARMAC brochure 2002. Available from http://www.pharmac.govt.nz/pdf/gout.pdf. We are grateful to Dr Peter Gow and Dr Doone Winnard for their review of this article. Wallace SL, Robinson H, Masi AT, et al. Preliminary criteria for the classification of the acute arthritis of primary gout. Arthritis Rheum 1977;20(3):895-900. Zhang W, Doherty M, Pascual E, et al. EULAR evidence based recommendations for gout. Part I: Diagnosis. Report of a task force of the Standing Committee for International Clinical Studies Including Therapeutics (ESCISIT). Ann Rheum Dis 2006;65(10):1301-11. Campion EW, Glynn RJ, DeLabry LO. Asymptomatic hyperuricemia. Risks and consequences in the Normative Aging Study. Am J Med 1987;82(3):421-6. Gibson T, Waterworth R, Hatfield P, et al. Hyperuricaemia, gout and kidney function in New Zealand Māori men. Br J Rheumatol 1984;23(4):276-82. Mikuls TR, MacLean CH, Olivieri J, et al. Quality of care indicators for gout management. Arthritis Rheum 2004;50(3):937-43. Jones P. The modern management of gout. New Ethicals Journal 2001;4:29-31. Perez-Ruiz F, Calabozo M, Pijoan JI, et al. Effect of urate-lowering therapy on the velocity of size reduction of tophi in chronic gout. Arthritis Rheum 2002;47(4):356-60. Li-Yu J, Clayburne G, Sieck M, et al. Treatment of chronic gout. Can we determine when urate stores are depleted enough to prevent attacks of gout? J Rheumatol 2001;28(3):577-80. Dalbeth N, Kumar S, Stamp L, Gow P. Dose adjustment of allopurinol according to creatinine clearance dose not provide adequate control of hyperuricaemia in patients with gout. J Rheumatology 2006;33:1646-50. Borstad GC, Bryant LR, Abel MP, et al. Colchicine for prophylaxis of acute flares when initiating allopurinol for chronic gouty arthritis. J Rheumatol 2004;31(12):2429-32. Reinders MK, van Roon EN, Houtman PM, et al. Biochemical effectiveness of allopurinol and allopurinol-probenecid in previously benzbromarone-treated gout patients. Clin Rheumatol 2007. Krejs GJ. Metabolic benefits associated with sibutramine therapy. Int J Obes Relat Metab Disord 2002;26 Suppl 4:S34-7. Dessein PH, Shipton EA, Stanwix AE, et al. Beneficial effects of weight loss associated with moderate calorie/carbohydrate restriction, and increased proportional intake of protein and unsaturated fat on serum urate and lipoprotein levels in gout: a pilot study. Ann Rheum Dis 2000;59(7):539-43. Choi HK, Atkinson K, Karlson EW, et al. Purine-rich foods, dairy and protein intake, and the risk of gout in men. N Engl J Med 2004;350(11):1093-103. Huang HY, Appel LJ, Choi MJ, et al. The effects of vitamin C supplementation on serum concentrations of uric acid: results of a randomized controlled trial. Arthritis Rheum 2005;52(6):1843-7. Gao X, Qi L, Qiao N, Choi HK, et al. Intake of added sugar and sugar-sweetened drink and serum uric acid concentration in US men and women. Hypertension 2007;50(2):306-12. Choi HK, Liu S, Curhan G. Intake of purine-rich foods, protein, and dairy products and relationship to serum levels of uric acid: the Third National Health and Nutrition Examination Survey. 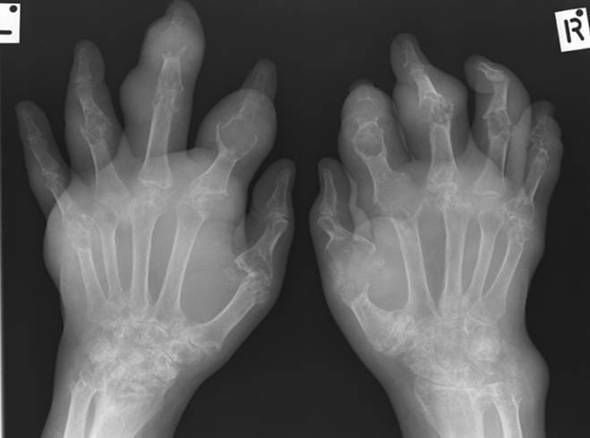 Arthritis Rheum 2005;52(1):283-9. Choi HK, Atkinson K, Karlson EW, et al. Alcohol intake and risk of incident gout in men: a prospective study. Lancet 2004;363(9417):1277-81. Choi HK, Willett W, Curhan G. Coffee consumption and risk of incident gout in men: a prospective study. Arthritis Rheum 2007;56(6):2049-55. Choi HK, Curhan G. Coffee, tea, and caffeine consumption and serum uric acid level: the third national health and nutrition examination survey. Arthritis Rheum 2007;57(5):816-21. Baker JF, Krishnan E, Chen L, Schumacher HR. Serum uric acid and cardiovascular disease: recent developments, and where do they leave us? Am J Med 2005;118(8):816-26. Krishnan E, Baker JF, Furst DE, Schumacher HR. Gout and the risk of acute myocardial infarction. Arthritis Rheum 2006;54(8):2688-96. Colvine K, Kerr A, McLachlan A, Gow PJ, Kumar S, Ly J, et al. Cardiovascular Risk Factor Assessment and Management in Gout: An Analysis Using Guideline Based Electronic Clinical Decision Support. In: American College of Rheumatology Annual Scientific Meeting. Washington DC, United States of America; 2006. Choi HK, Ford ES, Li C, Curhan G. Prevalence of the metabolic syndrome in patients with gout: the Third National Health and Nutrition Examination Survey. Arthritis Rheum 2007;57(1):109-15. Symmons D. Epidemiologic Concepts and Rheumatology. In: Klippel J, Dieppe P, editors. Rheumatology. 2nd ed. London: Mosby; 1998. Klemp P, Stansfield SA, Castle B, Robertson MC. Gout is on the increase in New Zealand. Ann Rheum Dis 1997;56(1):22-6. Dalbeth N, Gow P. Prevention of colchicine toxicity in patients with gout. N Z Med J 2007;120(1252):U2503. Chris Porter said: 30/03/2016 9:40:15 p.m.
Clarifies and reinforces what we have learnt about gout and the current lack of management in the majority of patients affected. Poor management centred around poor knowledge of options / treatments and preventative medication. Patients appear to have no real knowledge of long term damage from reoccurring gout attacks.